Cathy Kelly reports from a visit to Za'athari Refugee Camp, home to more than 80,000 Syrian refugees. WORLD War 2 still haunts and fascinates us – we watch films about it and shudder at the thought of people’s lives turned upside down by war, bombings and fear. We wonder at how countries turned their backs on refugees – and shake our heads at how Hitler’s Final Solution could happen in a modern world. We tell ourselves that we would never have turned our backs on our neighbours, irrespective of religion or ethnic background. We understand pain, we say, because of our history of pain and famine. Yet today, there are so many stories, of tribal wars, drought and famine, that the world tunes out. Despite our best efforts, it’s just another famine: more children with eyes huge with hunger, mothers with the thousand-yard stare of people who know their beloved baby will die. Somehow, even in Ireland, one of the world’s most philanthropic countries, we have pity fatigue. Today, thousands of miles to the East, the biggest refugee crisis since World War Two is raging on. Over three million people (out of a population of 23 million) have fled Syria as a result of the civil war which began in March 2011.UNICEF is working flat out to cope with the influx of refugees from Syria into Jordan, Iraq, Turkey and Lebanon, as well as trying to provide help in the potentially lethal Syrian country itself where there are believed to be over 5.6 million children in need. But the money is running out. The World Food Programme has cut food vouchers to the most vulnerable people, with the possibility to cutting them entirely. If this happens, the world will be watching these people starve and freeze to death. So what is life like in this refugee world? I travelled with UNICEF to the Za’atari camp in Jordan, just miles from the Syrian border. 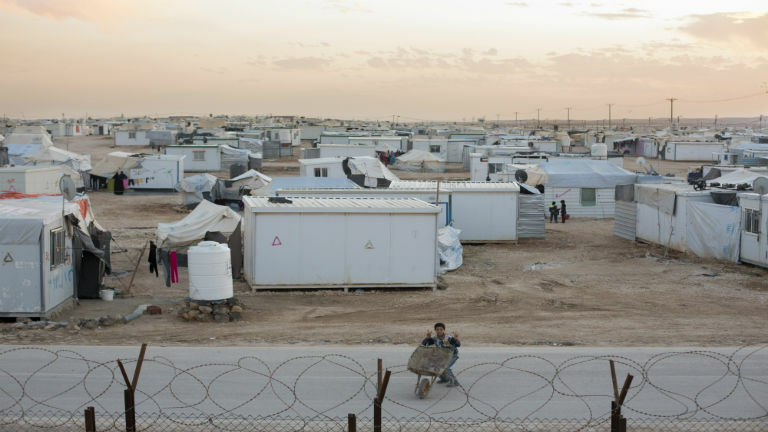 This camp is the now the fourth biggest city in Jordan, home to some 84,000 people, half of whom are children. At night, they feel the earth shake from shelling. The landscape’s flat, with three and a half-kilometres of tents and prefabs stretched out like a real-life post-apocalyptic world beloved of modern kids in thrall to movies like The Hunger Games. In a horrible irony, the camp is divided into twelve districts, like the districts in the movie. Thanks to donations to UNICEF from people like you, the camp’s children – some forty thousand kids – are cared for, vaccinated and in school. A savage polio outbreak in Syria last year meant a vast vaccination programme. A vital winterization programme run by UNICEF is underway to get winter clothes, boots and blankets to children in advance of the coming savage below-zero temperatures. Children go to school in shifts because of a lack of space and they hold their UNICEF bags up proudly – when your home is bombed and even precious teddies are gone, school in prefabs in a camp with kind teachers create some semblance of normality. They can play sports in the children’s areas and there is psychological counseling for those most affected by the horrors of war. They’ve seen their homes bombed, their relatives killed or taken, never to be seen again. Twenty-year-old new mother, Fatima, cuddles her five-week-old baby son, Adnan, one of ten babies born every day in the camp. She worries about winter. His home is a tarpaulin tent through which a fierce wind whistles. Vicious snow will come soon. Last December, this harsh climate saw a foot and a half of snow. Adnan’s mother, Fatima– who seems like a child herself at twenty – is terrified of how she will keep her baby warm. The bare tent she shares with her husband of a year has nothing in it: no baby toys, no baby books giving hints for the new mother, no heater. There are just thin foam mattresses for beds, fleecy blankets, an old metal cot, some baby powder and the shabby suitcase she must have used to flee her home in Syria 30 months ago. New mother, Fatima, says she doesn’t leave her tent in the refugee camp in case her baby gets sick. ‘The problem is the cold at night. We don’t have any means of getting him warm at night. His stomach hurts.’ It is impossible to imagine this baby – or any one of the babies born every day in this camp – surviving in such conditions in the inevitable snow. I hold him and his tiny stomach is taut with pain. I rub it gently, the way I used to with my own babies. Still, poor little Adnan cries. There is medical help here and Adnan has been vaccinated but in this strange world of the refugee camp, it is obvious that Fatima feels the only safe place is her small, bare tent. Some people get to leave the camps and settle in Amman, Jordan’s capital city – but what hope do they have for the future? Going back to Syria is not an option for mother-of-five Saeda. She and her five daughters live in a spartan apartment in a poor area of Amman. I cannot bear to ask her family about what they saw in Syria to make them flee, but I have to. Saeda might be forty-something but the eyes that survey me seem ancient. Wafa’a, a girl of sixteen, starts to cry and huddles her body protectively, a gesture anyone versed in post traumatic syndrome would instantly recognize. I don’t push to find out what has happened to this girl. As a mother, as a human being, I want to cry. I have no right to cry- they do. Their family shop was burned to the ground; they left with nothing. Essentially, they are the lucky ones – they are outside the camp. But they are still vulnerable and have received vital winterization programme vouchers from UNICEF so they can buy winter clothes. Saeda must buy gas for her ancient gas heater, and pay her electricity bill first. Winter clothes must wait. They must eat and try to stay warm here. They have nothing in her flat. Nothing. A bare bulb lights the ceiling. The smallest child, a boy of three, has no toys. As we say goodbye, I wonder what is their future? People in pain on the television often seem so remote to us, like they’re not like us. But they are. Wanting the best for their families, confused and worried, putting on a brave face for their families, like father Samir who brought his family, arms around the smallest ones, out of Syria when the shelling made him fear for his kids’ safety. He smiles at them with that parental face we all know: ‘it will all be fine,’ that face says. But unless we help – as a people and as a state – it won’t.